Earlier we looked at the essential guide to visual thinking where we discussed how to communicate visually. 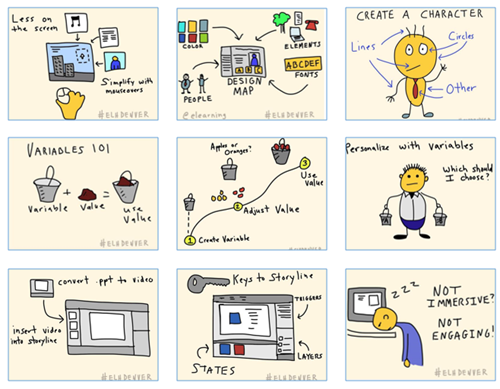 Coupled with that post, we explored practical ways to apply visual thinking skills to elearning course design. One advantage of visual thinking is learning to see the concepts and how to express them to others. Another advantage is that you gain the skills to create real assets that can be used in your elearning courses. Hand-drawn objects can create a personal and organic look. They are a stark contrast to the sterile corporate look that is so common in many courses. This contrast and the organic look can be used to craft an engaging look for the course. You don’t have to be an artist to create and use hand-drawn images. It just takes some practice. A couple of weeks ago, Blair Rorani facilitated a Twitter Draw-a-Thon. Each day a number of people submitted their sketch of that day’s object. This was a good exercise to think about the objects and how to draw them. One thing I learned was to streamline my drawings and use less to communicate more. I also tried to practice different face styles. As you can see, I’m not going to sustain a career in graphic design, but with some practice, I can create a few usable objects. Most objects are basic shapes, so you need to learn to see the basic shapes in the objects. Then practice drawing them. The more you practice, the better you get. Once you recognize the basic shapes you’ll get better at streamlining your drawings. I find that the less detail, the better. 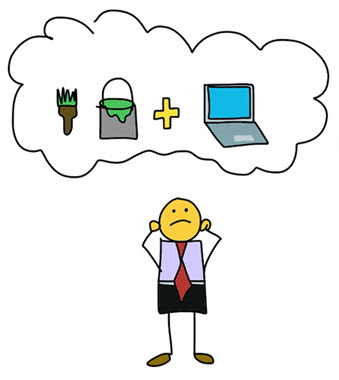 There are a few objects that are common to many elearning courses. Start by practicing to sketch them. Break them into basic shapes and then see what you can sketch. Here are a few common objects to get started. Feel free to add to the list in the comments section. 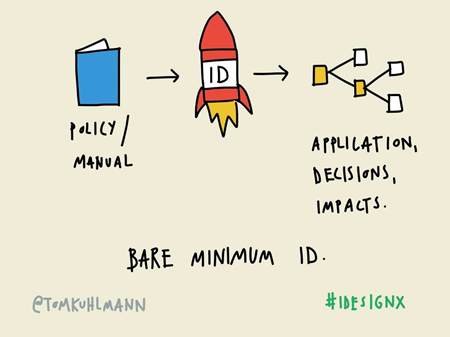 As I mentioned in this blog post on overcoming instructional design challenges, Blair Rorani live sketched my presentation. I liked what he did so I tried my hand at live sketching while at a workshop in Denver. You can see the results below. Find inspiration from what you like and copy it. I liked Blair’s style, so my first step was to mimic what he did. Now that I feel more comfortable I can begin to craft my own style. My initial sketches took too long between capturing the big idea and trying to make it work with the technology (I used the iPad and Adobe Ideas). However, once I completed a few of the sketches, I developed some basic procedures that helped make it faster. 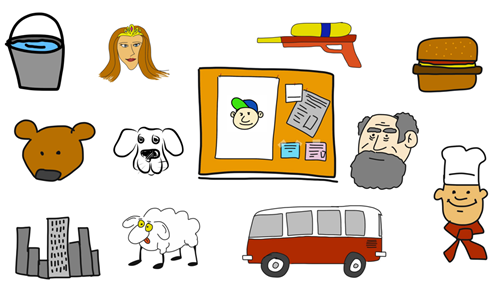 Spend some time practicing before doing it live or as you sketch for your elearning courses. One idea is to capture something going on at home. This would also probably produce a lot of laughs, too. Or just turn on the news and sketch what’s being discussed. The main point is to practice and to apply the basic concepts discussed above: use basic shapes to create objects and then practice sketching ideas. Don’t worry about everything being perfect. Just do it. They look nice as they are and there’s something engaging about the organic look. However I do recommend that you practice writing text, especially if you’re using an iPad. For the iPad I use the Cosmonaut stylus because the thicker pen helps me hold it more like I would on a whiteboard than on a piece of paper. I feel like I have more control when I draw. The newer PC tablets have pen input and some come with a stylus. We’re not all going to be artists who can crank out the best graphics. However, with some practice we can learn to communicate visually and streamline our graphics so they do work in our courses (assuming the proper context). I liked the way Jeff Kortenbosch worked his drawings into a presentation. Another example of how they could be incorporated into an elearning course. Do you draw your own objects? Feel free to share some examples in the comments section. Hi Tom, great post and indeed the draw-a-thon was an amazing experience. I truly recommend that anyone that feels insecure about their drawing capabilities just gives it a go and draw those 15 items we were asked to draw by Blair. Whether you’re using just paper, your tablet or draw on your computer, it’s an experience to remember! Here’s a little trick that I use to figure out *what* to draw to represent complex ideas (“procurement” and “quality assurance” are examples of ideas I wanted to communicate recently through visuals). Do a google image search for the word to see what comes up. You’ll probably find some commonalities amongst the results. For example, I decided to use a handshake as a symbol for procurement because it represented the nature of an agreement. If you then search for “handshake” you’ll come up with a lot more stuff. Some of which you might be able to use straight up under a creative commons license, or it’s a good reference point for your sketches. With some sketching tools you can trace over the image, which helps a lot for those who aren’t great at sketching! @Tom, fantastic round up on drawing and instructional design as always. And thank you for mentioning my work and new book!! It’s great to see how you’ve taken your drawing skills to the next level. As we all know by experience, you can only get better at something by practicing (or practising as we say at this end of the world). hi! this is very great! thanks for the information! Great tip Fiona, I do the same thing when I’m stuck!